Sandy and I don't want to be the type of guests that soak up hospitality and do nothing in return. So in addition to cooking meals and Sandy making desserts, we have begun to help Diane and Jerry clear out the dead limbs on many of the pine trees on their property. Not only do the trees look better, but by removing the dead branches up to six feet above ground, the risk of forest fire is greatly reduced. Here is a section of the woods that has not been cleared. Sandy and I used a battery powered Saws-All and an adjustable pole saw to do the trimming. Jerry used his chain saw to fell 14 trees. We worked about four hours with time out for lunch. The four us us are pretty dog tired. Sandy and I want to resume the work this coming week or longer until we've made a big impact. I am actually falling asleep while putting this message together. So I'll sign off and go take a nap. It's been a week since my last blog entry so I thought I'd better let you know what we are doing. But first an explanation of today's headline. Some Montana license plates carry three words at the top: The Treasure State. It is that and more. Taken in the Lolo National Forest looking toward Idaho. We picked huckleberries in this area. We remain at the McDonald/O'Neil family compound here in northwest Thompson Falls, MT. Mornings and evenings are cool and days are hot. But when you know it will cool off and get chilly at night, hot is not so bad. Neither of the homes here have air conditioning. We run ours in the motorhome because we are parked in the sun looking at a meadow, and Trixie prefers to be cool. So far, we have gone huckleberry picking twice, been on two long boat rides, played cards in the evening, enjoyed many family meals and, in general, had an all around great time. We are pretending that we won't have to leave. Sandy is spoiling our hosts with homemade huckleberry scones, lemon ice cream pie, and tonight we are being treated to the original recipe of Augusta Kohrs of the Grant-Kohrs National Historic Site. Her recipe dates from the mid-1800s. My cousin, Diane, came back from town yesterday and told us that she had seen a young bear about a half mile from their driveway. After talking with some wildlife experts she was able to identify it as a black bear. Way cool. Yesterday, Sandy and I gave Moose a good bath. It has been at least a month and the coach was really dirty and dusty. Now I don't have to wash my hands each time I close on of the bay doors. We drove here to Thompson Falls in the early evening on Thursday. Most of the last 90 miles was on a good two-lane highway, mountains on one or both sides, a beautiful river running by the road. It was a spectacular drive. My cousins live in a rural but easily accessible area west of Thompson Falls. It is still wild enough to support black bear and grizzlies. One home is in a meadow, the other is up a hill and surrounded by trees. Combined acreage is 25 acres. We are parked near the meadow on a gravel drive with 30 amps and sewer hook up. Life is good. The days are going to have an easy rhythm to them. These are the kind of relatives everyone should, but doesn't have. They are all fun to be with, interesting to talk with and really fine people. We all kind of did our own thing today, but also did a lot of interacting. Diane and Jerry McDonald stopped in around 1:00 so the four of us had lunch in our coach. Dinner was at six at the Meadow House and each of the three families brought dishes to share. Main entree was Sloppy Joes made from venison. Delicious. Around 7:30 Sandy and I piled into a Jeep (no top) and Diane and Jerry each took an ATV and we went up into the mountains to pick wild huckleberries. Shadow, the Bejon/Poodle mix, rode behind Diane. We stopped at the headwaters of Graves Creek Falls, which is a hidden and isolated and breathtakingly beautifully primitive area. Unfortunately, there was no way I could get down to the base of the falls to take a photograph that would depict the beauty of the place. The mountain road we were on is without a doubt the roughest road I have ever driven and I was amazed that the Jeep rolled through the pot holes instead of taking them with a sudden jolt. The three of us picked berries for about 30 minutes and collected just over a generous cup of berries. Sandy will make her famous scones tomorrow for breakfast. These will have wild Huckleberries in them. Interesting Note: Jerry pointed out bushes where the berries had been gnawed off, most likely by a bear. Next time we go picking we are taking our small air canister boat horn with us in case we encounter a bear. The wagon belonged to and was used on the Conrad Kohrs Ranch in Deer Lodge, Montana. We actually had an anxiety-free drive on Monday from the Gallatin National Forest to Deer Lodge, Montana. Nothing broke, overheated or went flat. A couple of on-going issues were present, but the drive was pleasant and about 160 miles in length. As we pulled into our site at Indian Creek Campground a good-looking blond lady came over and said to Sandy: "Are you Sandy?" It was Jane Montgomery. I "met" Jane's husband Jim on the RV-Dreams Forum well over two years ago. I figured that anybody who called himself "Gummy" had to be an interesting person. I was right. We went to dinner Monday night and then visited within each others motorhomes. Jim and Jane are like old friends. They are fun to be with, easy going and the kind of people who make unpretentious friendships. We like them. Now for the ranch part. Jim works a few days each week as a chuck wagon cook at the nearby Grant-Kohrs Ranch which became a National Historic Site by an Act of Congress in 1972. At one time the ranch contained 30,000 acres. Today it is 1,000 acres in size. Tuesday afternoon Jim and Jane accompanied us on a tour of this active working cattle ranch. The buildings are in great condition and the original home and addition built by Conrad Kohrs are exceptional. the 9,000 SF home better than from the front. The home had all of the modern conveniences of the 19th century. Unfortunately, photographs are not permitted and lighting inside the home is kept low to preserve surfaces and finishes. One of the spectacular household items we saw was a work of needlepoint by Augusta Kohrs, Conrad's wife. It resembles a fine drawing and should really hang in the Metropolitan Museum of Art in New York City. and $40/month when driving cattle on the trail. We did get to take a bit of ranch history home with us: a recipe for gingerbread in the handwriting of Augusta Kohrs. Sandy said she has all of the ingredients. Hmmmm. Could there be some gingerbread in my future? measure 84 inches between tips. Conrad Kohrs kept meticulous records of transactions and correspondence and today those documents present a 130-year-history of cattle ranching in Montana. During our guided tour of the home, we learned that there were actually document copiers back in the 18th and early 19th centuries. Letters were written using a special type of ink, then placed into a press along with a damp sheet of translucent paper. The pressure of the press transferred the ink to the second sheet, resulting in an exact copy. This correspondence and business records were bound into annual journals. The park ranger who took us on a 30-minute-tour of the home gave a thoroughly engrossing oral presentation. Seems like this is always the case with rangers. On Wednesday we drove to Missoula in order to have a problem on the big 450 HP Cummins engine checked out first thing Thursday morning. Then it is on to Thompson Falls. We departed from our campsite at the Angostura Reservoir near Hot Springs, South Dakota on Friday morning at 7:15. Because we did not have water or sewer hookups at that park we needed to stop at the dump station on the way out to empty our black and gray tanks and to take on fresh drinking water. We had the place to ourselves, which was good, because it takes a while to fill our 110 gallon fresh water tank. I got started on taking on fresh water. Sandy took care of dumping the waste water tanks. The fresh water supply hose was well separated from the dumping area and the supply end of the hose was actually suspended in the air so that it could not make contact with the ground. Just to be safe, I always spray the connection between our hose and the camp ground water supply with a solution of bleach before connecting the two. Our destination was 342 miles to the northwest, not very far over the state line between South Dakota and Wyoming. At 11:30 we pulled into a Rest Area for lunch. While Sandy made sandwiches, I took Trixie out to check out all of the animal smells. She likes that. The last 20 some miles were on an unrelenting steep mountain grade where we climbed from around 4,000 feet to 8540 feet in about 30 to 40 minutes. The road was filled with more twists than a Greek belly dancer can perform. Sudden death would be the result of one wrong move. Often the right lane was a few feet away from a drop of thousands of feet. Most of the road was two lane with no room to pull over -- except for the occasional turnout for drivers with overheated engines or overheated brakes. Suddenly we get a beeping sound and a warning light on the dash that said: SHUT OFF ENGINE. Luckily for us we were in a construction zone with a wide spot where we could pull over to let the engine cool down before resuming our journey. I later found out that I was over working the engine by not keeping it in a lower gear. We are still learning as we go along. That night we stayed in a pine forest at 8400 feet very close to a small mountain lake named Sibley Lake in Wyoming. It is the kind of location where commercials could be filmed. We talked with several campers and people fishing and met their dogs. Almost everyone who camps has dogs. A fishing couple told us the temperature would probably fall to 46 that night. They also said that it once snowed on July 4th where we were at. It only got into the low 50s, but that cool mountain air makes for great sleeping. Saturday we got up early to drive 326 miles to the Red Cliff Campground in the Gallatin National Forest. Because this is a U.S. Park, we get to use our "America the Beautiful Pass" and got two nights of camping for only $27. Not bad. Some days are more "exciting that others. Saturday was one of those days. Remember that twisting Wyoming road we drove up and overheated the engine? Now we had to come down it. Long story short. We pretty much lost our brakes. Fortunately, about four miles down the mountain we decided to pull into one of the turn outs to get a few pictures and to let the brakes cool off a bit. As soon as I got out of the coach I could smell HOT brakes. When I touched one of the real aluminum wheels it burned my fingers. We called good friend and White Knight Gary Omel, waking him at about 7 a.m. in California. Gary told us what to do and we followed his directions. What we needed to do was keep the transmission in first or second gear with our retarder control pulled all the way back to keep our road speed to 30 MPH or under. Gary's directions worked like a charm. But wait there is more. The last 25 or 30 miles to the campground has safety turnouts about every two miles. One of my legs was cramping so I pulled into a turn out to stretch my legs. We were there five minutes and pulled away. As soon as I got back on the road we got a shrill beep, beep, beep from our tire monitor indicating low pressure in one of the rear tires. Long story short. We made it safely to our camp ground in the Gallatin National Forest. We have a leak in one of the rear tires. We have to wait until sometime Monday before our road service -- Coach-Net -- can get someone out to fix the tire. These tires are only about 3 months old so hope it is nothing worse than a nail in the tread. While at Red Cliff we checked out the countryside. on the trail from our camp site. inconvenienced. It could have been far worse. We are now in Deer Lodge, MT until Wednesday morning. When I walk around the campground I often think back to the time when I had two weeks for vacation and generally took one week and went somewhere. As nice as those vacations were, they were always tinged with the reality that I had to go back to work and to "the real world." My remembrances are reinforced on Sundays and Mondays. For Sundays it is when we see a lot of people packing up and pulling out of their camp site. For Mondays it is noticing how few campers remain. Then for so many of those who have to get back to reality, the cycle begins all over on Wednesdays and Thursdays when the campgrounds begin to fill up again. We don't experience those thoughts anymore. Now when we leave our camp site it is with the wonder of what will we see next. Will it be something unique? Will we meet a new friend? Similarly, most days are unstructured. Today was one of those days. We packed a picnic lunch and went back to Custer State Park. We wanted to see the Crazy Horse monument and we did from a distance, but we declined to fork over $20 to see this work in progress up close. Lake Stockade and had lunch on the shore. out of their cars near buffalo. Yesterday we spent some time in nearby Hot Springs. There are many building constructed from limestone quarried nearby. These are elegant and grand structures. This is the schoolhouse that housed grades 1-12 from 1893 through 1961. Today it is home to a museum filled with artifacts from early life in this frontier town. It was built at a total cost of $23,550. Today was perfect. It was 67F when I went for my morning walk. The walk that I've been skipping a few too many times of late. You know how that goes. We decided it was a good day to drive to Mount Rushmore National Memorial and see the world-famous carvings of four very influential presidents. In a word it is: MAGNIFICENT! For a good portion of the drive north we were in Custer State Park where we encountered some new-to-us wildlife. This little Prairie Dog kept popping up and down his hole like he was in a carnival shooting gallery. He communicated with his buddies in nearby holes with a series of high-pitched squeaks. Next we came across this small grouping of antelope. That is a baby hiding in the tall grass in front of the bottom antelope. Then I got the "money shot." As we neared a curve, traffic slowed and then stopped. We spotted a Bison up ahead ambling alongside of the park road. Cars started moving again and with several in back of me I grabbed my Canon camera, put it in rapid shooting mode, aimed, held down the shutter release and as we drove by I hopped for the best. I got lucky. What a magnificent animal. When we were three miles from the Mount Rushmore we pulled into a scenic overlook for this picture. The National Park Service has done a wonderful job at Mount Rushmore. Parking is plentiful, we even saw a couple of 40 foot RVs in the lot, everything is clean and well planned, the exhibits are fascinating and engrossing and the movie describing the sculpting of the memorial is informative. To the right of the carved figures of the presidents is this rock formation which Sandy noticed has a likeness to an elephant. Thunderstorms are known to pop up quickly on the high plains and I was hoping these clouds would go away. They did. Here we are with some distinguished company in the background. Cloud photos can be more impressive than sunsets. Tonight's sunset isn't very dramatic, but it is serene. Here is our front yard until Friday morning. The small white object in back of Moose is "Dome Boy" -- our Winegard Carry Out satellite receiver we use when trees near the motorhome block the signal from reaching the satellite dish on top of the motorhome. When Sandy found this campground on the map she knew it was called a fort. It is that and much more. Fort Robinson was an active military post from 1874 to 1948. There is a lot of history here. I got to thinking about how so much of the history of the western half of the U.S. is really not that old. When this military outpost was founded in1874 the Union contained 37 states. Five years later Thomas Edison would invent the electric light bulb. In 11 years the first automobile would be developed by Benz. That doesn't detract from our history, it just illustrates that so many major events didn't take place that long ago. But back to Fort Robinson. It is huge and it is very pastoral. Lots of big trees. Lots of buildings and lots of well-tended grounds. It reminds me of a laid back and well-tended resort. Fort Robinson was established as a post-Civil War Indian Agency protective post, but the interpretation of the word "protective" is certain open to interpretation. 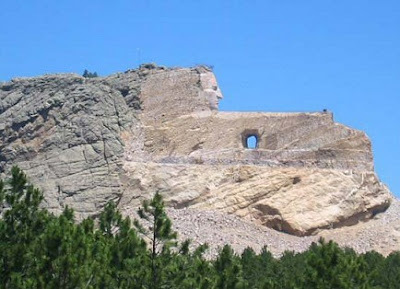 Especially since Chief Crazy Horse was murdered here. Fort Robinson no longer belongs to the U.S. and that might explain why the State of Nebraska has done something really unique: it rents out many of the Enlisted Men and Officers' living quarters to tourists. We saw groups of friends or families spending time on large front porches or having dinner on a side porch. The former Enlisted Men Barracks has been turned into a lodge complete with cafe. Interestingly, no rooms on the fort grounds have television or phones -- so you can really get away from the rat race here. The fort was in operation for 74 years and has a rich history spanning its establishment as an Indian Agency protective post to holding German POW's during WWII. When the U.S. Army Cavalry used horses the fort was a "remount" facility and had as many as 2,000 horses and hundreds of mules on the grounds. Dogs were also trained here for military use. Another interesting piece of Fort Robinson history is that Walter Reed served as post physician for a number of years. This morning we went to the Post Headquarters built in 1905. The beautiful old two-story white sided structure is now a museum. It has been filled with many, many photos and artifacts to help tell the 74 year history of the fort. We also viewed a few of the other buildings but we could not go inside today. Not all structures are open to visitors every day. Cottonwood trees are ubiquitous here on the high plains and some of them are magnificent. These two flank the entrance to our campground. From their size I am positive that they were very small trees back in 1874. The building seen between the trees is the Veterinary Medicine Building. Inside is a unique equine operating table. Horses would be led next to a vertical wooden wall, strapped in place and then anesthetized. Once they were subdued, the wall would be cranked into a horizontal operating table. The building contained sleeping quarters for night attendants and a stable in back to hold up to 20 horses receiving treatment. the adobe officers' quarters (above). I like the detail in the chimney's of the officers' quarters. Not too shabby for government work in 1887.
increased, more housing was needed. Three of the original Officers' Row residences remain. was stabbed by a soldier. Tomorrow we head into South Dakota. Stay tuned.